For the past 20 years, our electricians have been transforming people's homes. This might mean rewiring the whole house, or just giving the kitchen or bathroom a bit of a facelift. We also carry out maintenance work for local authorities and housing groups. In 2005, strict regulations were introduced regarding electrical work in private homes. We hold all relevant certifications and qualifications to undertake this work. Need an extra phone socket or internet connection? We can help! We install outdoor sockets that are compliant with all relevant safety standards. Whether you need to change a light fitting or add a socket, we can help! We can completely rewire the whole house. If required, existing wiring will be upgraded to comply with consumer protection standards. No home is safe without a working smoke alarm. We offer the peace of mind associated with having one expertly fitted. You can choose between a battery operated alarm, or one that is hardwired into your home. We provide and fit a wide range of CCTV smart systems and burglar alarms. We can also offer motion censored LED lighting and an array of other security options. We install a wide range of central heating systems. This ensures that you find the most energy efficient system for your home. Heating systems come in either Y plan or S plan, and you can choose either a wired or wireless thermostat. Kitchens and bathrooms - Did you know? The average person changes their bathroom and kitchen three times in their lifetime. We specialise in electrics that are the perfect fit for your new room. We can adjust layouts, add sockets, fit new lighting or add an extractor fan. We want your new room to be flawless, let's make it happen! When an electrical circuit is faulty or overloaded, it can cause a power cut on that circuit, or in the whole house. All of our electricians are trained to quickly and efficiently find and fix the problem. Your electrics will be back to normal before you know it. Any work we carry out for you is covered by our insurance. 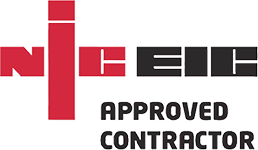 Each job will also be certified in accordance with NICEIC safety standards.